Shroud as a negative –what is the key of the phenomena, and why the Shroud is unique. I think the first one to belittle the importance of the Shroud as negative was Joe Nickell in his Inquest on the Shroud of Turin –this was later picked up by another sceptics. I have myself written two polemical articles (here is oneand another) with two guys using argumentation borrowed from Nickell. The problem is that sceptics use classical fallacy of equivocation –the negative as mirror imprint (for example animal tracks) and the photographic negative. This is like mixing file folders to hold papers with computer files and folders. For changing meaning of the term ‘negative’ see classical article by Isabel Piczek The Concept of Negativity Through the Ages vs The Negative Image on the Shroud. Anyway the problem remains –why the Shroud is so special as photographic negative? What is the magic in the Shroud that negative image of it (discovered by Pia in 1898) is much more detailed and vivid than positive image? It is not simple inversion of tones, not to say about mirror inversion of orientation –those are trivial. So what’s the secret? Unfortunately, this is usually never explained in simple, clear logical and correct way. So I will try. We should have noticed two things. First the greyscale range has narrowed, now it is only from 25 up to 194. That increases contrast and makes the details easier to see. Secondly, we see that after tonal inversion the image is much vivid. It is because our eyes are better adapted to see bright shapes on dark background than vice versa. Now that’s really cool! The figure and it’s details are fully visible. Why? 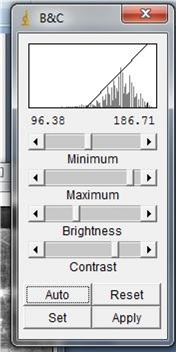 Because we have further narrowed greyscale ranges (now ranging from 96.38 to 186.71, nearly three times less than original) and increased contrast. Film negatives usually have less contrast, but a wider dynamic range, than the final printed positive images. The contrast typically increases when they are printed onto photographic paper. That’s it, as the original Shroud is in fact a kind of “film negative”, and negative images of it are in fact positives (“photographic paper” we could say). That’s why negative images of the Shroud allow us to see more details. The original full-greyscale image of the Shroud figure is in fact “compressed” on the cloth, so our eyes are unable to resolve different values of intensity. Only contrast-enhancing photographic negatives (or digital manipulations) enable us to do so. What are the implications for forgery theory? Giant –medieval people were simply unable to paint full, smooth-gradation greyscale image not only in tone-reversal, but first of all in compressed scale. Their eyes were the same like ours –the alleged forger should have well calibrated photometers in them. In fact, the photographic characteristic of the Shroud alone refutes overwhelming majority of forgery theories. One should be aware that the information about different grey levels is integral part of the Shroud image –encoded within it. It can be practically excluded that this encoding is just accidental –for example that it remained within residual image, after all paint had flaked off, like Charles Freeman proposes. It must have been in the original image (and somehow survived erosion, which usually has no uniform rate for all the parts of the cloth) –which returns us to the argument that painting negative image, especially out of nothing, is rather beyond human capabilities. Such a splendid posting – beautifully explained and surely correct in its conclusions. It has to be the best ‘why do things look the way they do? think- pieces since Hugh Farey’s on banding (had to say that to preserve balance). Even if there was a single shred, nay fibre, of scientifically-based validity to the flaked-off paint assumption (which there’s not) it could easily be discarded by reference to another aspect of the TS image that I don’t suppose our tunnel-vision historian friend has given a moment’s consideration (that’s assuming he even knows about it). I refer to the image’s so-called non-directional character. To be painted as such, the artist would have had to abandon any idea of directional light casting the light and shade that gives form to images. It seems scarcely possible he could do that, or even have a reason to do that. So what if he painted a conventional image employing different gray-values of pigments to achieve contrast between light and dark. For flaking to have produced the present non-directional image, there would not only have to have been selective flaking off of the darker pigments that represent shade but their subsequent migration and attachment to the lighter zones to achieve some kind of equalization effect, and somehow manage to evade chemical detection. The term I believe for all of that is wild fantasy. Ever so slightly more realistically (so as to match those boring old facts) the process of shedding flakes would have needed to somehow ‘cook’ or chemically etch the underlying linen fibres to achieve the right chemistry that resulted not only in chemical dehydration and superficial yellowing of the carbohydrates, as deduced by STURP from spectral and chemical properties, but also their mechanical weakening in image-bearing zones (recalling the greater ease of stripping off image fibres with the Mylar sticky tape). The sorcerer’s apprentice in Disney’s Fantasia could maybe have done that, but it’s hard to think of other candidates. Time maybe to close the file on painting, and return to the various -ographies already on offer – Jackson and others’ radiography (*), Fanti’s ionocoronography (**) Rogers’ chemography(***), Garlaschelli’s powder-assisted tactilography (****), oh, and as a last resort, there’s always that tedious thermography (*****) that no one on this site bar one wants to know about . Some might detect the tiny degree of subjectivity that crept into this comment towards the end. We scientists have to do this you realize – if only to demonstrate we’re human, same as everyone else. 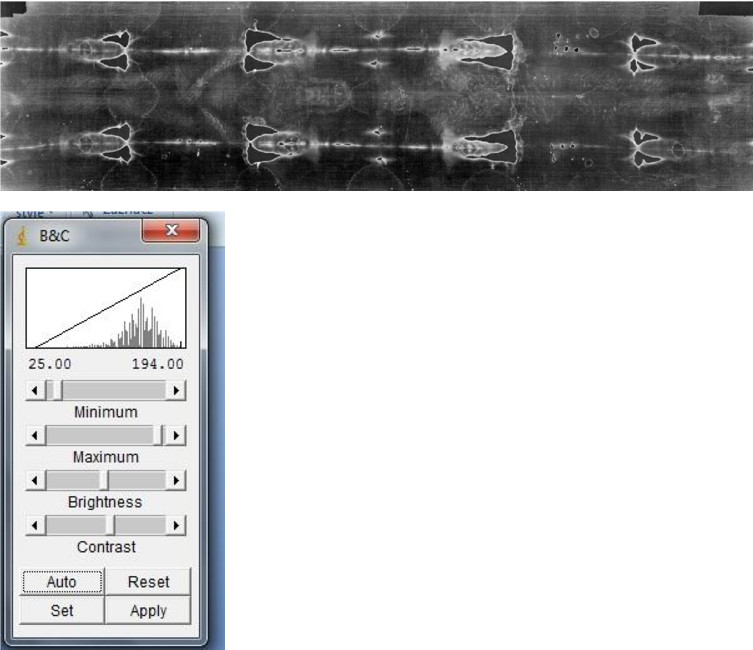 I have to say to preserve balance: read the discussion on banding (https://shroudstory.com/2014/08/29/more-about-banding-on-the-shroud-of-turin/) and the prequel of Hugh’s confusing post. But why don’t you write a pdf about thermography Colin? Pdfs are for those who have arrived at some firm conclusions. This blogger rarely arrives at firm conclusions. It’s more a case of slowly evolving ideas, with occasional crystallization on matters of detail. It’s soft, not hard science, best confined to blogs – my own and other people’s, especially web forums. like this one for instant feedback. Having said that I may do a short posting soon, summarising the “sweat imprint” hypothesis, playing down the high-temperature scorch mechanism (others being possible if chemically-assisted) and probably stripping out the 1314 Templar reference point, me not being a historian. I’ve responded to your question anoxie. Please try to give a civil reply. I shan’t be offended if you wish to remain silent. Thank you OK for your very informative article. Thank you Dan for publishing it. To get an idea about grey scales historians must learn/study digital imaginary. Short course in remote sensing applications helped me to understand about grey scales and digital images. Exellent article,, once more my sincere congratulations to O,K,. After reading such an informative paper only dishonest people with an hidden agenda to discredit the Shroud could state that old crap that a medieval forger did indeed achieve to produce a negative body image on a linen sheet, whith ALL GREY SCALE GRADATIONS AS THE SHROUD IMAGE. This is one more reason to discard the photographic image theory namely the infamous Leonardo’s photographic negative crucified corpse image . This is an amazing post in that it deals quite substantially, and scientifically, with the issue at hand. One of the problems I see is that we have too many “experts” in one field spouting-off in areas in which they are not expert. Charles Freeman is an art historian. That does not make him an expert on physics. His “learned” opinions on things such as negativity are simply not in his area of expertise. His opinions are really speculations. Now a word for the hated class of humanity – lawyers, especially litigators. Evaluating expert testimony is a part of what we do on a regular basis. I have one case where representing a plaintiff, I recently used an expert accountant to assess a damage issue. Whether that expert was appropriate is now an issue on appeal by the losing (so far) side. Point is, that when dealing with the image, reference must be made to physics, not the speculations of an art historian publishing in a history journal, peer reviewed, I expect by other historians, if at all. One more point, although I have occasionally twitted Colin (really without malice, it’s a Yankee thing I guess) his latest contributions have been remarkable and productive although we differ on the ultimate issue. OK’s post is physics. It must be rebutted, if at all, on the basis of physics. In 2000, I brought in a fiber base print of the Enrie’s collection along with a digital file to Eastman Kodak. Eastman Kodak’s engineers along with Phil Larock Kodak digital imaging photographer concluded that the banding was the attributed to the cloth’s converting mirror frequencies. (I believe that was Hughs’ assertion too). Guest posting by OK, is a sound article, however, questions of human’s ability to create a negative image (Thermomechanical process for example) can be argued. Another interesting factor discussed a few years ago from my LinkedIn “science group of color specialist” asserted that the cloth hemming-bone weave pattern was crucial to the image if lennsing was attributed to the formation. If the Shroud was made from a traditional 2-1 weave, apparent edge sharpness would be lost. Human observation may have played a roll in selecting a 3-1 weave pattern to create the image. So many mysteries, and when all said and done, we may never know. what do you mean by “lensing”? HSG, your 3rd paragraph is very intriguing. If one prefers the medieval provenance theory then you are saying the artisan chose the 3-1 weave perhaps after much experimentation. It would be no accident then that this weave was chosen. Certainly the artisan was beyond diligent in forming this ‘exquisite’ image. An unknown master of masters, really. If one prefers the 1st century provenance theory, then we may have an inkling as to why no such other burial images have been found over time. The 3-1 weave was not, likely, the usual type of linen used for burials. The TS may be unique this way, it may be, as some have hypothesized, a linen meant for use as a altar cloth or some other more luxurious usage. It was utilized as a burial shroud out of haste and/or reverence for the deceased. The use of this 3-1 weave then was providential, with of course no human observation that it would provide for an image at all. Good point David, “If one prefers the 1st century provenance theory, then we may have an inkling as to why no such other burial images have been found over time. The 3-1 weave was not, likely, the usual type of linen used for burials”. Vertical imaging. Parallel to the cloth. “Parallel to the cloth”… and the cloth flat i guess? In photography the light source would be the same degree as the subject in this case a flat art. In Thermal, a receptor would have been applied; possibly by a flue mechanism (Draft) or transfer. I don’t understand what you mean. But thinking the cloth was flat during the image formation is already a gamble. Lensing from the herring-bone weave? Interesting possibilities for further investigation maybe. I have often been fascinated with the wavy interference patterns from the folds in gauze curtains. You can even see them in a doubled-up air-filter from a clothes dryer. I’ve explained to young folk that it demonstrates the wave properties of light. I wonder if there’s some association with the way that the TS image was formed. Could it be something to do with the pitch of the weave? The physics of light can yield some interesting surprises. Your paper is very interesting. I have the HaltaDefinizione pictures and I would like to verify your claims using GIMP. “It” being the COLOR Durante photograph. I do not understand: what do you mean by “default greyscale” of a color photo. 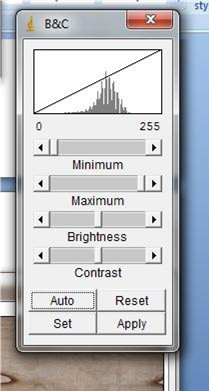 The histogram of greyscale values rigth below first Shroud image. You have the HaltaDefinizione digital photograhs or you have some (or entire!) screenshot extracts from the HaltaDefinizione Web 2.0 app?